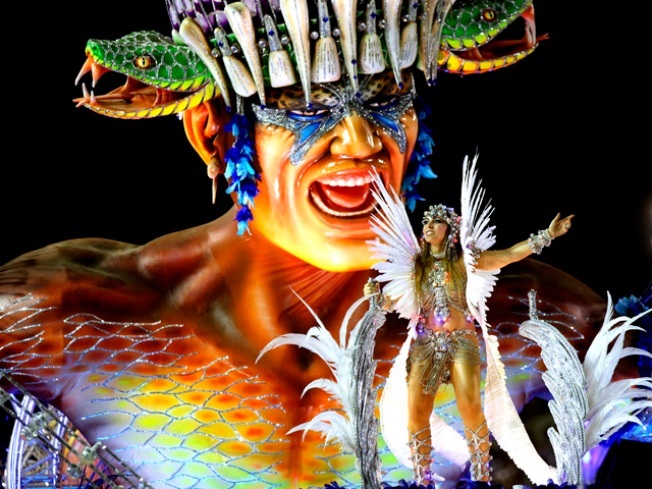 A member of Beija Flor samba school performs on a float during carnival celebrations at the Sambadrome in Rio de Janeiro on Feb.15. CARNIVAL FUN:Brazil is going to celebrate its culture in a very big way with a street fair in Pacific Beach this afternoon. This street social is going to feature traditional Brazilian cuisine, crafts, fine art, music and dancing on two stages. Headlining the whole event is a carnival style parade featuring dancers and music. Admission is free, the day starts at noon and the parade runs from 3 to 4 p.m., all of it taking place on and around Garnett Avenue in PB. TASTES THIS: Art and food are going to rain supreme at Taste of University Heights, an event celebrating the cuisine and artwork of the talented people of the community. In it’s third season, the food event is paired with the University Heights Arts open where over 100 new and professional artists are going to display work of all kinds ranging from paintings to photography, jewelry, mixed media and more. Admission to the art event is free and tickets for the food portion will only cost $15 to $20. For more info check this link. FUNNY PEOPLE: If your looking for laughs and a full stomach on a Sunday night, try Ki’s Restaurant for some live stand-up comedy paired with a 4-course dinner. Comedian David Zasloff, and more, plan on cracking you up- that is, in-between your bites to eat. Dinner seating starts at 6:45 p.m. and the comedy show kicks off at 7:30. If your only looking to laugh then get a ticket for the stand-up for only 10 bucks, with a 4-course dinner and show ticket costing $39. Stay connected to what’s going on around town by signing up for our daily newsletter.